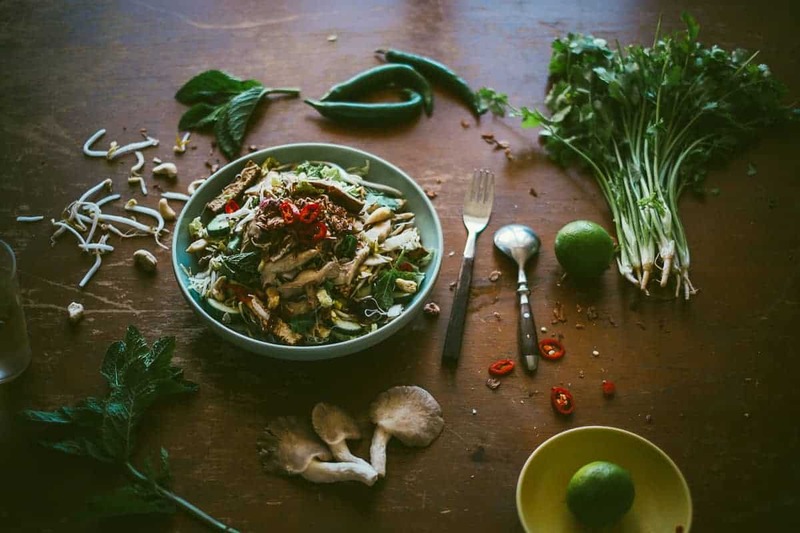 This Asian mushroom noodle salad draws inspiration from Thailand. It’s a perfect summer recipe. Sydney really is a great place to be in the summer months. And I kind of wanted to start off the new year on a lighter note, in terms of cooking and experimenting with different recipes. It’s always the way with me at the beginning of a new year. Today I’m presenting my second recipe for the Australian Mushroom Growers Association. I’ve created a sort of hybrid stir fry/salad combo. I know it sounds odd but it came about by accident in my tiny kitchen. I wanted an “Asian inspired” recipe that was fun, fresh and healthy yet did not leave you hungry. My Asian inspired salad draws on flavours from Thailand and includes a variety of mushrooms for an interesting mix. I’ve used shiitake, Enoki and oyster mushrooms and combined them with some firm tofu, shredded savoy cabbage, cucumbers and rice noodles (even though they’re not quite visible in the pics!). Once the mushrooms are quickly stir fried they are added to the warmed through rice noodles and tossed with fresh herbs, a handful of bean shoots, a few crushed raw cashews and a “zingy” dressing. Garnish with some fried shallots and you have a complete meal. It might seem like a few too many things going on but trust me. This was delicious! Just be prepared and have everything ready to go and you will be ready in no time. If you’re in Australia, enjoy the summer and make sure you cover up! Part salad, part stir fry. This Asian mushroom noodle salad combines exotic Asian mushrooms and fresh ingredients for a perfect summer meal. Heat the peanut oil in a wok or large frypan. Allow the oil to become hot before tossing in the mushrooms. Add the ginger and stir fry the mushrooms for 2 mins until cooked through. 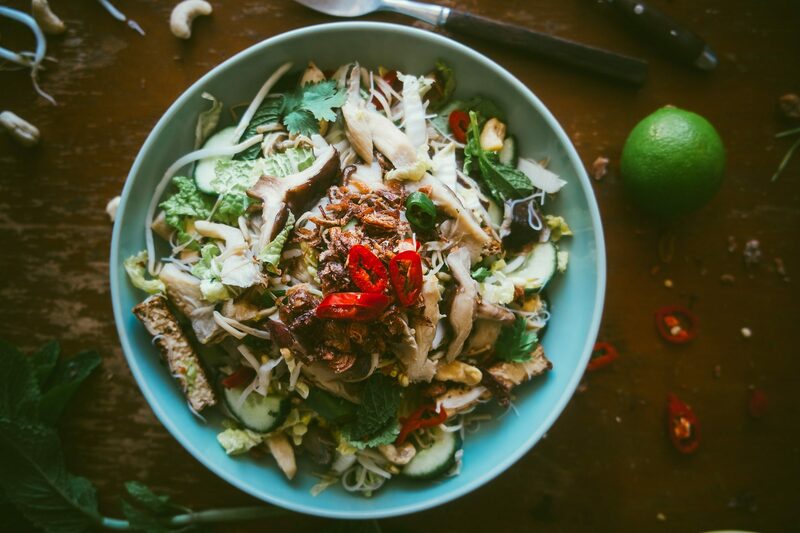 Place the cooked rice noodles in a large bowl and add the mushrooms, cabbage, bean shoots, cucumber, tofu, mint, coriander and cashews. Combine the dressing ingredients in a jar and shake well. Add to the salad and mix well. Top with chillies and fried shallots and serve immediately. Souvlaki For The Soul would like to acknowledge its partnership with the Australian Mushroom Growers Association for this sponsored post. The recipe above was created, developed and photographed by Souvlaki For The Soul using a variety of Asian mushrooms.